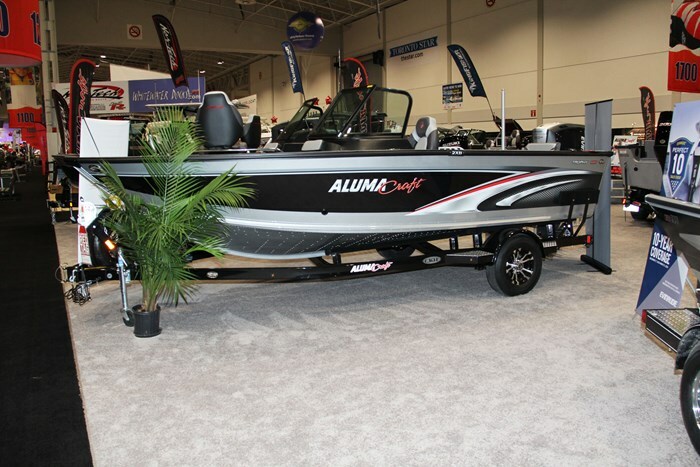 The four model Trophy series from seventeen to twenty feet is just one of Alumacraft’s fifteen series of welded and riveted aluminum boats ranging from Jon and Utility boats through Bay, Bass, and Crappie boats to Mod-V and Deep-V’s comprising literally dozens of models. 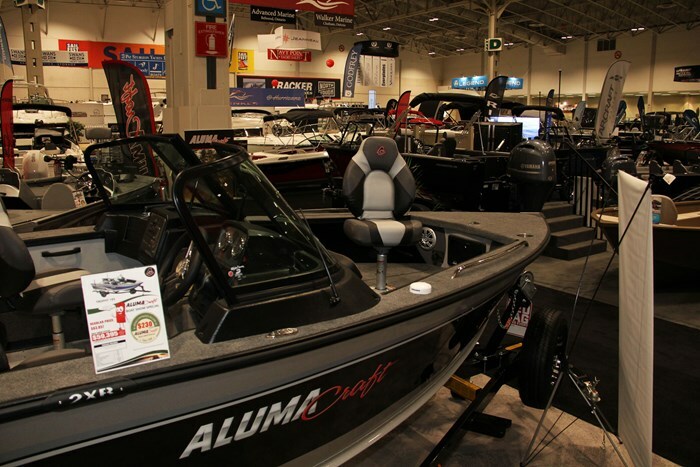 Alumacraft calls its Trophy models its “Signature Series” and each of the four models offers flexibility for fishing and for family recreational activities. The 185 Trophy is the second smallest in this series but offers a most comprehensive complement of standard equipment and an even greater selection of available optional equipment to satisfy the most ardent fishing or recreational enthusiast; or both, and all in one package. 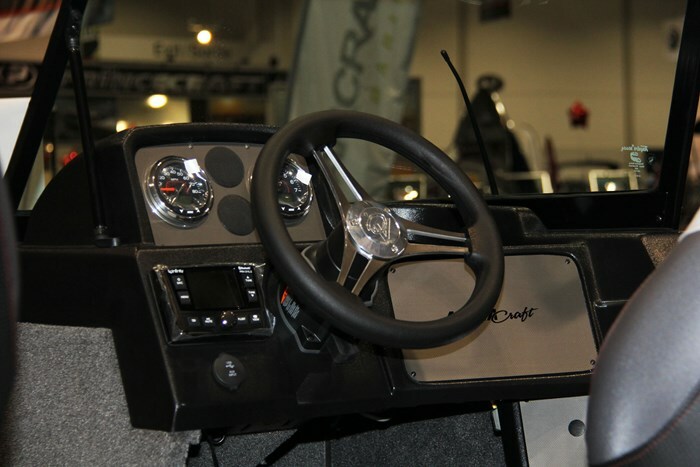 All Trophy models are dual consoles with a high, three-piece walk-thru windshield. The 185 Trophy is rated for a horsepower maximum of 175 with various Evinrude, Honda, or Suzuki outboard models from 115 up to that maximum 175 being available from the factory. Three main hull colour choices are available with another four choices of hull accent colours. Standard flooring throughout is grey vinyl and you can choose carpet in the cockpit. You can further opt for Tan vinyl throughout, or carpet throughout with Grey or Tan vinyl in the cockpit. Snap-in carpet is also optionally available. Floor mats in either Grey or Tan are also available. Three high-back upholstered form-fitting seats with, get this, air-ride pedestals come standard along with a pair of stern fold-down jump seats that when folded, become part of the stern casting platform. The driver’s seat comes with a standard slider. Additional seats are available with a total of six floor mounts to accommodate them; four in the cockpit and one each on the bow and stern casting platforms. 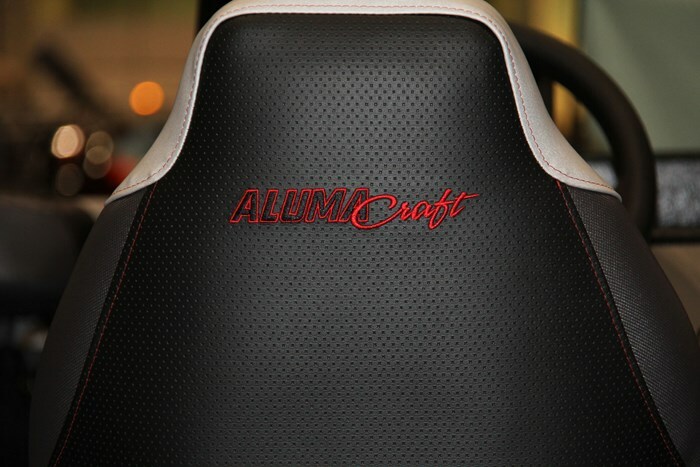 Pro-Casting seats are also optionally available. The molded helm console is most modern and flexible to accommodate the instrumentation of your choice. Standard analog instrumentation includes speedometer, tachometer, volt meter and fuel gauge. A tilt sporty wheel is standard as is hydraulic steering along with a combination USB and auxiliary-adapter charging port. The standard in-dash Infinity PRV-315 AM/FM Bluetooth-compatible stereo comes with four speakers. Instead of the standard analog gauge cluster, this dash space plus some available space to the left of the steering wheel may be outfitted with one or two choices from a total available selection of thirty-one Garmin. Humminbird, or Lowrance GPS/fishfinder screens to mix and match within these spaces as you choose depending on your navigation and/or fishing/sonar priorities. Below the dash is a standard storage drawer on sliders. Similarly, the molded passenger dash is used in its entirety with a large lockable glove box, molded-in knick-knack tray on the top, molded-in drink holder, plus a molded-in smart phone holder on the front panel with retaining elastic strap. Below the passenger dash is another standard pull out storage drawer. Optional cargo netting is available to restrain stored items between the top of these two drawers and the bottom of the two consoles. 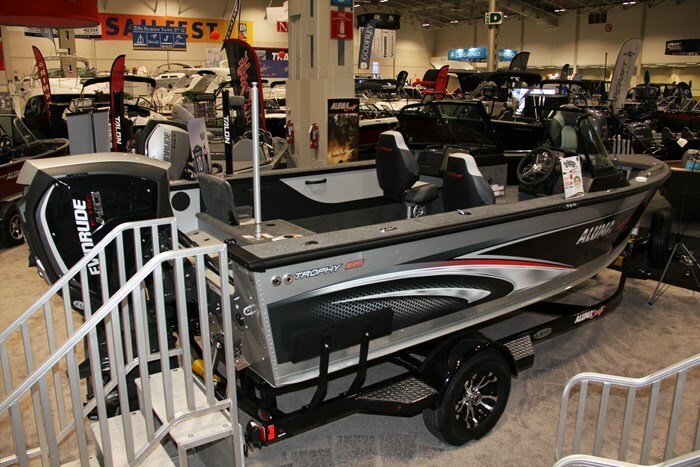 Three separate in-floor storage compartments are located within the bow casting platform. Centered within the bow platform is a lockable rod storage compartment with LED lighting and suitable for rods up to eight feet. A small storage compartment located in the cockpit floor between the consoles is ideal for four tackle trays. Additional lockable rod storage is found within the port gunnel and a smaller general storage compartment is within the starboard gunnel. Whether fishing or cruising, the two 18-gallon aerated and timed livewells with LED lighting, one within each casting platform will be put to excellent use. Safety grab handles including long, low grab rails atop the foredeck gunnels serve all seating positions in the 185 Trophy. 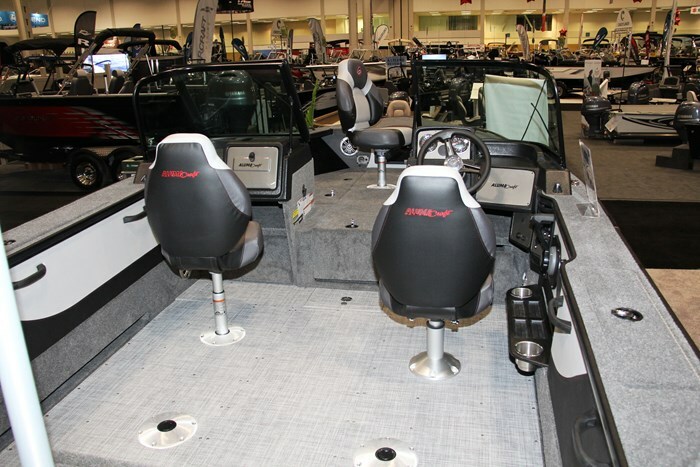 Additional standard equipment includes courtesy lighting, built-in toe holds, pre-wiring for a 12 or 24-volt trolling motor, Aluma-Trac accessory mounting system, a boarding ladder, plus standard cushions on the forward face of each of the consoles to facilitate lounging out on the bow platform. 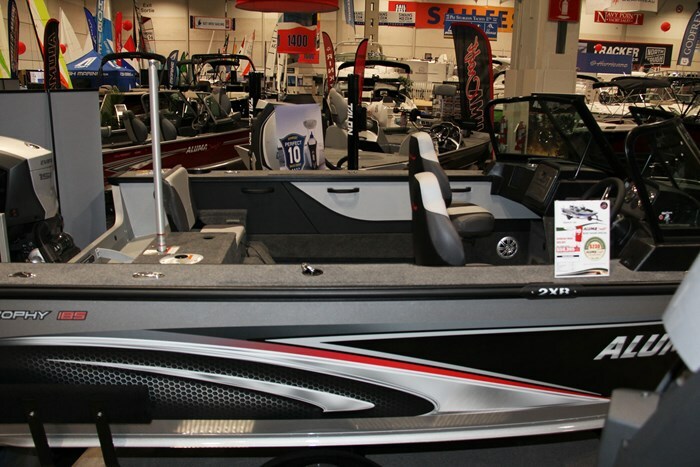 The extensive list of optional equipment not already mentioned above includes a bow cushion set to fill the bow casting platform, bow coaming cushion padding, bow cargo netting for under the coamings, a kicker engine, nineteen choices of MinnKota trolling motors, and twenty Aluma-Trac accessory choices. You may also want a ski pylon or stereo speaker upgrade. Optional canvas choices include a bimini top set with or without side curtains and aft curtain, a bow cover, walkway curtain, and travel cover. There are also twenty-eight choices of Custom, Eagle, or Shoreland’r trailers. With the extensive list of standard and available optional equipment, your Alumacraft 185 Trophy may be outfitted to the most exacting demands of fishing or cruising or both all in one package.